As I walked to work this week, I officially started to see signs of spring in Chicago. The dogs are out, sidewalks being washed, flowers planted and the homeless have emerged. When I think of spring, I think of the preppy look. I am not talking Zack Morris preppy, but rather plaids and pastels – that country club chic look. So in honor of spring’s arrival, here are my preppy picks. I am OBSESSED with picnics. While my boyfriend refuses to picnic with me (come on Brady, we have a beach in our backyard! 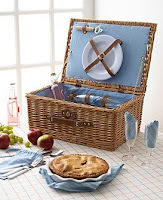 ), I saw this Martha Stewart basket at Macy’s and almost splurged. Now that this is on sale, it will find a way to 65 E. Scott very soon. “Prep” – this book from Curtis Sittenfeld is an easy, adorable read. Its about a small town girl who gets the opportunity to go to a East Coast prep school. It goes through high school stereotypes in a much cooler way than “High School Musical.” I believe I heard they are trying to make it a movie as well, so read it before they ruin it with a lead character like Hilary Duff.